Goosebumps. Feel it all. Let this music, the words and imagery, the recording and creative process, touch your heart and soul; the voices, the clarity, the beautifully resonant yet crisp voices, their hearts, humanity. Feel it all. So beautiful. Oh, and the Italian … oh, my, goodness … no words. no words. Love, pure love is all I feel … and I want to go to Italy again. Ed Sheeran, Andrea Bocelli, are heart-openers: Perfect Symphony. After a long long break, music finally returned again into my life, and forever more will always be a part of my life in some way. Even though I do not any longer perform, heart music fuels photography and music fires up art and music helps writing flow and vice versa. Being a creative, especially during this time on the planet is the greatest thing in the world. Truly, artists are blessed people. 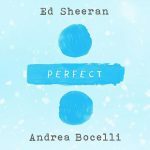 Thank you to Ed Sheeran and Andrea Bocelli for their beautiful inspiration, and …Perfect.